The new sounds are supplied as a GT project. Roland has just given its V-Synth GT a shot in the arm by way of a new patch collection. This contains in excess of 450 sounds that emulate a wide range of classic synths. 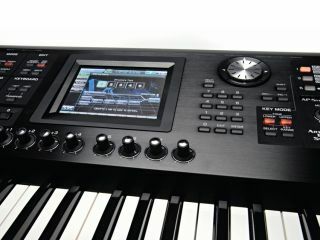 Roland's Juno. Jupiter, SH, TB-303 and D-50 models are all covered. In addition, there are new filter bank patches that are designed to enable the processing of external audio sources. Commenting on the release of the collection, Roland Project Manager Vince LaDuca said: "The download has been assembled as a GT project, so it's easy to load, and the patches are mapped to the V-Synth GT's real-time controls, including the signature time-trip pad. "Users can add these patches to their existing GT projects with the GT's librarian software." You can download the collection now from the Roland US website.